Today, we completed the Instructor Specialties after the September IDC/IE. We, being Nienke and me. 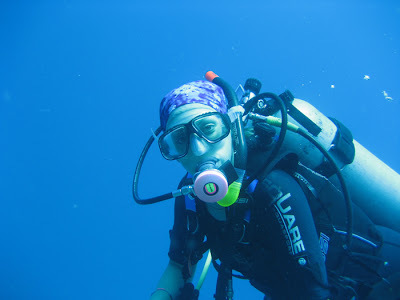 The Specialties that I taught Nienke where on Monday; Search & Recovery and Night diving. The Search & recovery dive turned out to be a very interesting dive by the amount of fish we encountered on Chaweng Beach, including a Lion fish, a fairly rare sight in the Gulf of Thailand. 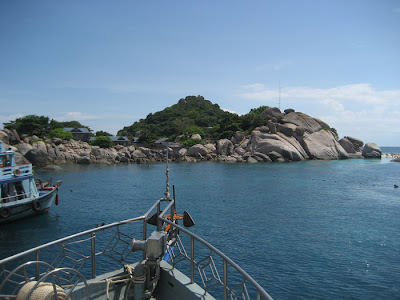 On Tuesday we took the Seatran ferry out to Koh Tao, where we switched to our own boat, the MV Waverunner. Here's a picture of the Waverunner's bow with Koh Nangyuan in the background whilst the boat is anchored in Japanese Garden. Here's Nienke relaxing at the end of the day on the Waverunner after two very nice and relaxing dives, in which we conducted a Naturalist and Navigation dive. Today we completed the Instructor Specialty training with two Deep dives as part of the Deep diving specialty at Sail Rock. 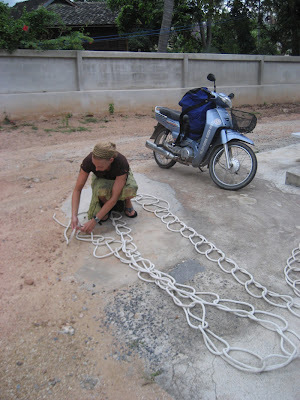 Here's Nienke in action to prepare a 40 meter long rope, so it doesn't get entangled once we want to throw the rope overboard and use it as a descent/reference line. 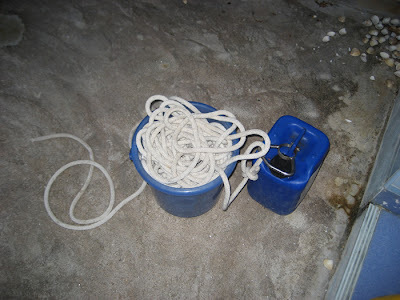 This is how 40 meters of rope look like once they're correctly prepared, it just fits in this small bucket and it won't get entangled! Last but not least, Nienke today at Sail Rock, during the second Deep dive of the day. The visibility was fantastic with up to 20 to 25 meters.